Nature publishing group introduced Nature Index at the end of 2014. This index is essentially a collection of author affiliations mentioned in the research papers published in 68 selected high-quality journals. Nature index can be used (and respective tools are provided in NPG website) to assess the high-quality scientific output by region, research institution and subject. Obviously Index by itself does not say anything about the quality level of an individual study or researcher. Nevertheless, it is quite useful to estimate general trends. Nature Index can be accessed openly for 12-month rolling window. 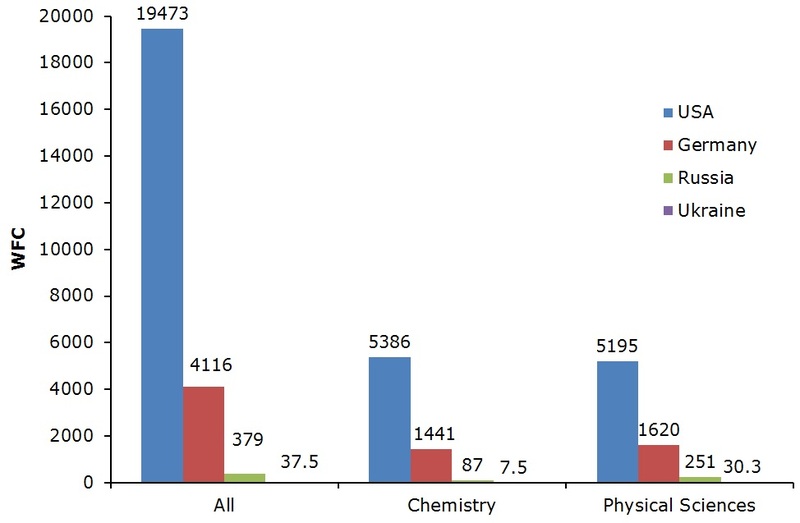 The current window discussed here includes data between 1 October 2013 and 30 September 2014 for 145 countries compiled from 60 thousand articles in 4 categories: Chemistry, Earth & Environmental Sciences, Life Sciences and Physical Sciences. Although scientific output can be estimated by sheer number of articles per country or institution (article count, AC), I prefer weighted fractional count (WFC) that down weight overrepresented articles in astronomy and astrophysics journals and takes into account how many authors from each institution are in each article. The latter is also represented in fractional count (FC) measure. So all the following refers here to WFC. I will first overview scientific output by country and then by institution for all subjects and for chemistry. After mentioning leaders, I also give more details on countries where I have lived for a long time and on institutions where I have studied or worked. The global leader in scientific output is the United States of America. The US has over three times more publications than the second best China. Germany as the third-strongest is the first in Europe. Its WFC is five times smaller than that of the US. The same trio (and in the same order) leads chemistry research. The success of Germany is determined by strong scientific tradition, good funding, excellent research facilities and relatively high salaries. These factors attract best scientists from all over the world. To put it into a perspective, Ukraine’s WFC is hundred times smaller than Germany’s WFC that places Ukraine at the 41st position between Slovenia and Thailand. It is still in the top half of the list. This score is astonishingly high taking into account miserable salaries at the universities, sweatshop working conditions in labs and general political and economic situation over last decades in the country. All above has triggered substantial brain drain from Ukraine to better funded places. The latest shattering events in Ukraine will cause further drop in scientific output in the nearest future because of the shortage of research funding, but also due to direct damage for science caused by the war and annexation of Crimea. Concerning Russia, its science enjoyed over last years reasonable funding and its scientific output for the current 12-month rolling window is ten times larger than Ukrainian, but it is still more than 50 times smaller than that of the US. Russia is located between Israel and Belgium at the 19th position when all subjects considered and at the 21st position between Denmark and Poland in chemistry. Ukrainian and Russian research profiles are quite similar, which originates from their common inheritance from the Soviet Union. Russia has got a larger piece of this inheritance. Another informative measure can be scientific output per capita. Really, how Slovenia with its 2 million people can compete with the US that has over 320 million people? Thus, I list here all countries sorted according to their WFC per 1 million of inhabitants (WFCpm) together with the number of articles in high-quality journals published per 1 million (ACpm) for the current 12-month rolling window. * Population is taken from the Wikipedia article’s version with ID 641244702 as is. It is a good estimate, but can obviously have deviations from real numbers. Surprise! The best country is Vatican! The reason is that Vatican supports Observatory, scientists of which co-authored 11 papers. Still, very good for Vatican’s contribution to the science. As for other, larger countries, then absolute leader is Switzerland that provides a platform for excellent research and where “one million of people” published 322 scientific articles. Speaking figuratively, in Switzerland, each small town with 3 thousand people produces a high-quality research paper. Singapore is another country with high-density science output followed by excellent result of the US with 89 papers per million (61 WFCpm). Germany has even higher number of 109 ACpm, but a bit smaller WFCpm (51). China and Russia have similar productivity with 2 to 4 WFCpm (6 to 8 ACpm). Ukraine produces 4 articles per million (~1.0 WFCpm). The quality or rather bad quality of research can be also judged in a different complementary way. A month ago one study projected geographically suspected plagiarism based on the preprint archive data analysis. Their results indicate that the least amount of plagiarism is expected from such countries as the US and Germany, a bit larger portion of plagiarism is expected from Ukraine, Russia and China (the same range and in the very first version of the published map only boundaries of the Soviet Union were shown), while the largest plagiarism rate is expected for instance from Bulgaria. Chinese Academy of Sciences (CAS) is leading globally by its total WFC followed by Harvard University and French National Centre for Scientific Research (CNRS). Max Planck Society is on the fourth position followed by Stanford University and MIT. One needs to remember, that CAS and Max Planck Society have large number of individual research institutions, but they are example of excellent hosts for scientific research. In comparison, the National Academy of Sciences of Ukraine (NASU) hosting many other institutions is at the 542 position. My first University—National Technical University of Ukraine Kiev Polytechnic Institute (NTUU KPI)—is at the 4735th position and the best among other Ukrainian universities, while my second alma mater—University of Erlangen-Nuremberg (FAU)—is at 158th. I know personally that excellent research is done by talented scientists at the NTUU “KPI”, but it is hard to compete with other universities, when while being one of the largest and best Ukrainian universities NTUU “KPI” has not a single NMR spectrometer, because it’s simply too expensive! Still, my colleagues there manage to publish their research even in Science and Nature Chemistry. On this note, you may be lucky to belong to one of the best research institutions or countries, but irrespective of your current position you must remember that it is you, who is responsible for the quality of your own research! The population of Namibia is 2.1 Mio, not 10,000.
thank you for noticing it. Indeed, wrong numbers were taken for Namibia and Myanmar. I’ll fix that. One interesting plot would be the GDP of each country versus its “research output” (be it WFC or AC or what have you). The extent to which these do not correlate (to some extent they obviously do) may be taken to imply the exten to which “research” is unnecessary for the economical development of a country. On a personal note, I have never, ever, found a paper in Science or Nature that I found interesting to read. To be quite frank, I see these two publications as “science for the masses” (and Nature, at least, started out as a popular science magazine, not introducing peer review until the 60s and not changing their mission statement [putting focus on research rather than popular science] until the early 2000s) in a small, easily digestible format without too many formulas. Yes, you are right, GDP vs “research output” would be definitely interesting to plot. AC, FC and WFC do not collect only papers from Science or Nature, but from many other journals, like JACS and Angew. Chemie. See the full list in a link given above. 1 Pings/Trackbacks for "Geography of High-Quality Science"